Spinach is a vegetable that is very rich in iron. It is recommended to include spinach as a part of your diet on a regular basis. 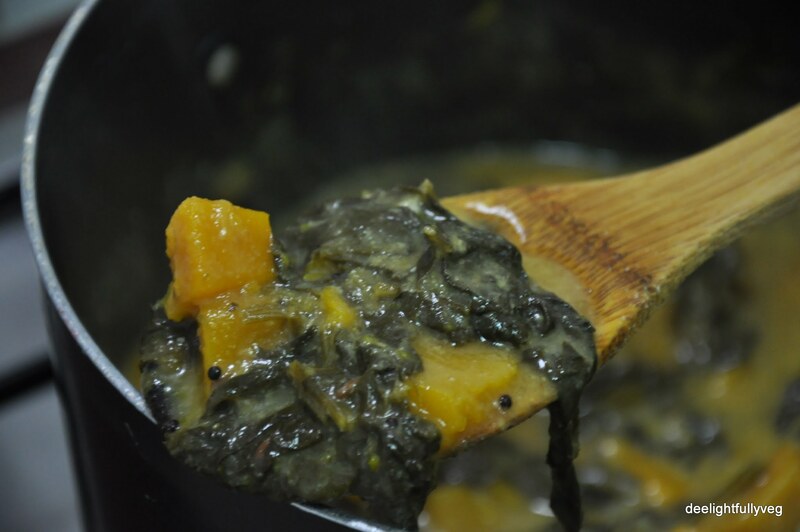 Spinach is used in gravy side dishes in Indian cooking. One of my favourite combinations is to use spinach with corn. The sweetness of corn brings some order to the fiery Indian spices used in this dish. Since it’s a gravy dish, you can also easily transform it into a Spinach Corn Rice that can be served with papads or wafers. It also works beautifully as a lunchbox recipe. Try it out and you will become a fan of this combination! Wash the spinach leaves well (at least 3-4 times) and cut off the stems. Cut the leaves into big pieces. Fill a vessel filled with water and heat it till it boils. When the water starts bubbling vigorously, add the cut spinach leaves and let them boil for 3-4 minutes. Switch off the flame. Now wash the leaves immediately in ice-cold water – this helps in preserving the green colour of spinach. This process is called blanching. Meanwhile boil the corn kernels in salted hot water for at least 10 mins. Alternatively, you can pressure cook the corn kernels for 3-4 whistles depending on the rawness of the kernels. Frozen corn kernels take more time than fresh corn kernels. In a blender / mixer, puree the blanched spinach leaves into a smooth paste. Keep it aside. Take a pan, add oil and cumin seeds in it. Once the cumin seeds splutter, add the chopped onions. Saute till they turn light pink in colour. Next, add the tomato puree and salt and mix well. Let this cook on low flame for 5 mins. The rawness of tomatoes should not be felt in the paste. Once the tomato puree is cooked through, add in turmeric powder, red chilli powder and garam masala powder and mix the spices well. Add the spinach puree, cover the pan and let it cook for 3 – 4 minutes. Finally, add the boiled corn kernels and cook for another 3 mins. Switch off the flame and serve hot with rotis. Also goes great with steamed white rice. Make sure you have ice-cold water ready once you add the spinach leaves into the boiling water. Do not overcook the spinach leaves. Once they become a rich, dark green, turn off the flame immediately. Make sure the corn is tender when you add it in. There’s not much cooking time given for the corn in the final stage, and it may taste raw. I like to use yellow pumpkins extensively while cooking – they are versatile and can be used in sweet as well as savoury preparations. In South India, Sambhar is a very common dish made using lentils and / or coconut. In this version of Sambhar I have trimmed down both these ingredients and made a non-traditional version. There was no compromise from the taste aspect as this dish turned out to be delicious. 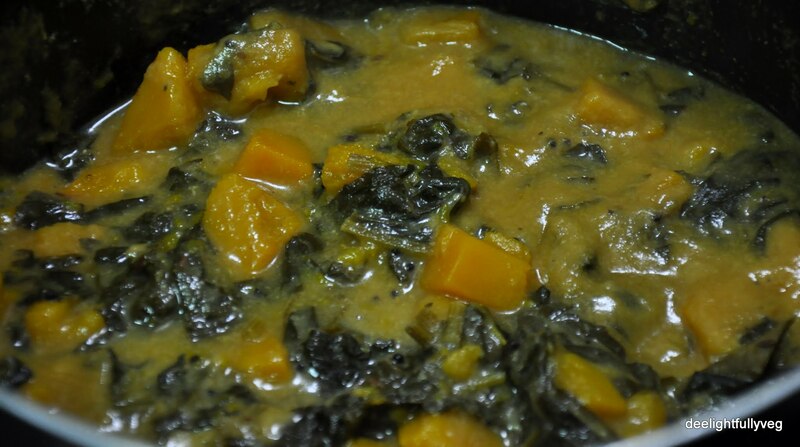 You will be surprised what a good combination yellow pumpkin and spinach make with each other! Dry roast the chana dal and urad dal till golden brown in a small fry pan. Let it cool down for 10 mins. Grind the roasted dal along with ingredients for curry paste into a smooth paste. Use a little water during the grinding process. Now take oil in a vessel and add mustard seeds. Once they splutter, add in the curry leaves and saute them for a minute. Add in the diced pumpkin cubes along with some salt to taste and mix well. Add the tamarind extract such that the pumpkin cubes are immersed in the tamarind water (you may need to add a little water). Cover the pan with a lid and allow the pumpkin to cook on a low to medium flame. Once they are just soft, stir in the spinach leaves, cover the vessel with a lid and let it cook till the spinach is just wilted. Now add in the curry paste along with 1 cup of water and let it come to boil on low flame. Then turn off the flame and let it rest for 15 – 20 minutes (covered with a lid). Serve it hot with steamed rice or rotis. Make sure to let the dal cool before grinding. When grinding, make a smooth paste – otherwise the final texture will be grainy. It was one of those days when I felt like shopping and expended all my energy buying things! I had to come home and dish out a quick meal. A vegetable and rice which does not have a lot of prep work is my go-to option during such times. This fabulous spinach rice was the outcome. Spinach is very easy to cut, once you have ensured that the leaves are nicely washed. I had some feta cheese sitting in the refrigerator which I tossed into this rice. Then all I needed to do was to dig into this delicious meal. Boil the rice in water for about 10 – 15 minutes. Then drain the water and let it cool for around 15 mins. Pulse the spinach and coriander leaves in a food processor or finely chop them. Heat the pan on low flame and add oil and the fennel seeds. When you smell the fennel aroma, add the finely chopped onions with some salt. Add salt lightly at this stage as feta is inherently salty. Sauté the onions just enough to lightly brown them. Now mix the pulsed spinach and coriander with the onions. Than add the chopped garlic pieces. Roast the cashews separately and add them to the above mixture. Now add the rice and gently mix. The rice should become green evenly. Cook it on low flame for 5 mins. 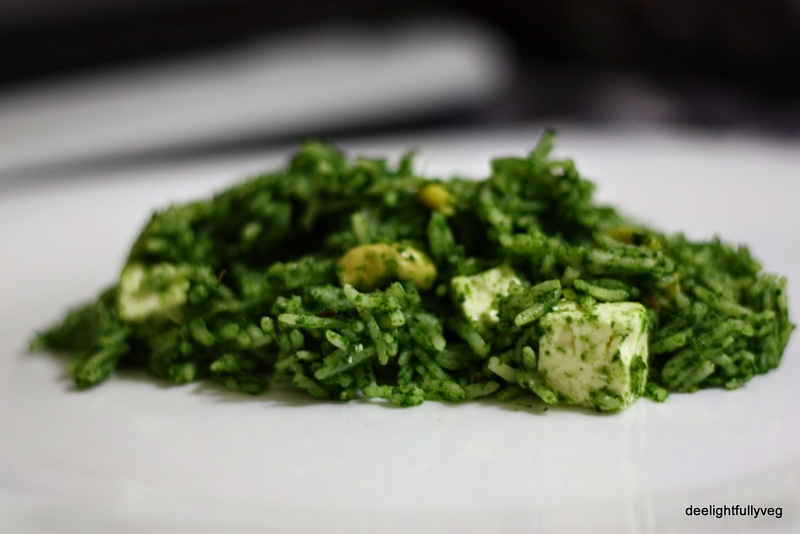 Garnish with the feta cubes and your rice is all set to be served. You can cook the rice in a pressure cooker. Just let it cook and fluff it before adding to the pan. Be careful when you stir in the rice. Overmixing will cause the rice to lose shape. Be gentle. Taste as you go – the feta will add a lot of salt. You need not cut the feta into cubes. Instead, you can just lightly crumble it into the rice. While making my green smoothies, I used up most of the spinach lying in the refrigerator. The final packet of spinach would not be sufficient in itself for a whole dish. To complement the leafy texture, I tossed in some cabbage. To add some crunch in the dish, I decided to go with lentils. This made it possible for the dish to go beautifully with rotis or dal & rice. The green and yellow colours of the whole dish made it visually very appealing. Since both the veggies also cook fast, it was a quick dish to make. Soak moong dal in water for 30 mins. Heat oil in a pan and add the mustard seeds. Once they splutter add the urad dal, curry leaves and dried red chillies and sauté them for a minute. Now add the chopped spinach and cabbage along with the drained moong dal. Also add turmeric and salt at this stage and mix well. Cover the pan with a lid and cook the curry for about 15-20 mins. 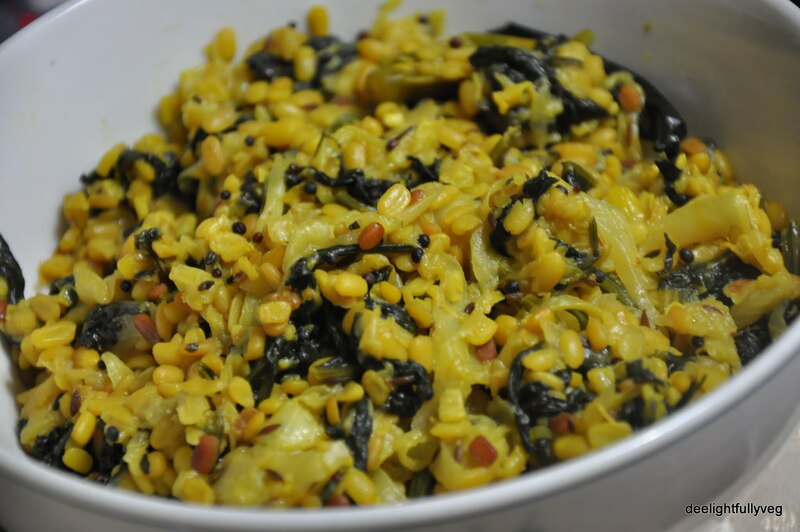 The moong dal and cabbage will take slightly more time to cook than the spinach. Switch off the flame and the delicious curry is all to set to be served with rotis or rice. Do not add too much water as the moong dal will turn mushy. Sprinkle water or else best cook with a lid. Stir the vegetables once in between else the veggies at the bottom of the pan might get burnt.